A very short post before the weekend. I always wondered if there was a quick way to derive the expected production rates per day from the total recoverable oil volume (URR). That can be handy, when a new oilfield discovery has been announced for instance. More below the fold. Pickering, A., The Oil Reserves Production Relationship, Energy Economics (2007). abstract. hmmm! These values seem strangely familiar. Lately, a major oil find (Tupi field) has been announced by Petrobas (Brazil) yesterday. 5-8 Gb of recoverable oil, that should give between 260 and 390 kbpd using the Small Fringe parameters. However, Exploration and Production Director Guilherme Estrella said: "Petrobras could possibly produce 100,000 barrels a day at Tupi by 2010 or 2011". Using this 100 kbpd figure, we get a recoverable oil volume estimate between 0.15 Gb and 1.34 Gb. Khebab - I've been doing a bit of frantic reading around this and a couple of points. The first is that in their official press release Petrobras refer to an area called Tupi that may conatin this amount of oil. It does not seem to be a single pool. And when they say they hope to produce at 100,000 bpd by 2010 or 2011 - this is a very optimistic time line, but not impossible since this will be produced from a floating production system. These are often used to conduct extended well tests - and so it is possible they are thinking of using exisiting equipment to conduct long tests on a small number of wells - this would provide a lot of valuable information on reservoir volume, connectivity and performance. They can add more production later by adding more ships. Some other points. This is in 1500 to 3000 m of water. I think Petrobras currently operate up to 1000 m - so this is pushing the envelope into new engineering territory. But Petrobras are word leaders at doing this. They also say this is light oil - at 28 API this is not light but intermediate crude. It is lighter I believe than the other oil they produce. 2006 Brazil produced 1.8 mmbpd and consumed 2.1 mmbpd -so this should help them atain and maintain self sufficiency. I agree, it's probably too early to know the impact of this discovery. 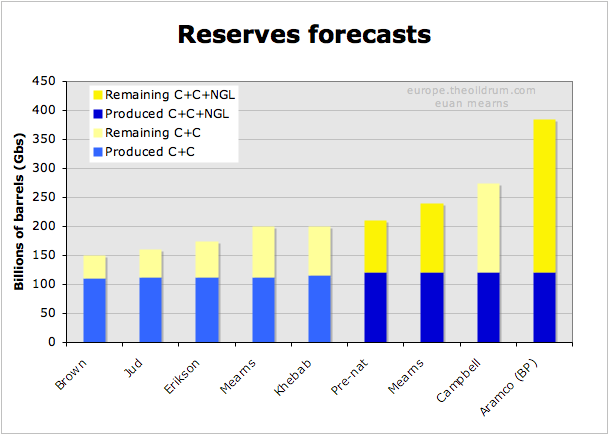 We don't even know the Oil&Gas ratio yet (recoverable volumes are given in BOE). Is "hacking" a new type of mathematical operation? Har Har. "They also say this is light oil - at 28 API this is not light but intermediate crude. It is lighter I believe than the other oil they produce." That is what I get from their press releases too. Brazilian oil is heavy to the point that we mostly don't refine it, we sell and buy light oil. That field seem to have the lightest oil of Brazil. "...this is a very optimistic time line..."
Brazilian governemnt is always optimist when talking about energy. Very interesting post, Khebab, that opens a can of worms. New discoveries and the expected flow rates are being inflated by publishing OIIP instead of proved. They are the asymptote to which URR will approach but never reach. New oil discoveries are being overstated on the old basis and there won't be any reserve growth. Things are even worse than they look. I've done similar simple projects but I interpret the results differently. First extraction from a oil field is not symmetric maintaining production rates in older field requires a continuous injection of technology and simple drilling of new wells. This inflates the production rate estimates post peak and the projected URR. Your results need to be adjusted for technical improvements. In effect your making a simple assumption of Business as usual but it makes sense that these would be high estimates and that they would be corrected to include advances in extraction technology. I think if the same analysis was performed from say 1950-1980 you could see that we have increased our extraction capabilities a lot between the two eras. My opinion is of course that these URR's are inflated and whats been happening is we have gotten very good at extracting oil. R has been steadily increasing because P has been steadily increasing and technology advances have introduced a large uncorrected systematic bias. To my knowledge all current ways to estimate URR don't correct for this. You would have to find similar fields that where extracted well beyond peak using different technologies to figure out the how much technology has actually improved extraction rates. To date we mix production rates from decades ago that used simple technology and fresh fields with technical advances as the fields aged. A simple example is Ghawar the current production rates would probably be much lower if they had not upgraded the extraction methods. So it makes sense that methods that use production data to predict URR will give inflated results. Obviously over 20-30 years you end up 50% or so high in URR estimates if you treat technical advances as acting like compound interest. How did you come up with 2% for the technical inflation tax, memmel? Basically from considering the "doglegs" in the HL charts. We even have one on the global oil production if you look. This boost was basically purely technical we did not discover a new KSA in 2003 but the increasing prices caused us to redouble our technical efforts. If you look at the world graph you notice that the curve underwent a noticeable change in 1980 the year I've picked as when technical innovation really started taking hold in the oil fields. The real world peak or 50% URR is basically completely hidden by the combination of technical innovation increasing extraction rates and world politics. But it should have been in about 1990 if we had not advanced so much in extraction technology. So if we can do 3% a year because of a increase in oil price it stands to reason that technology overtime seems to be giving about a 2% increase in extraction rates as its developed and deployed on average over the decades. It could well be higher but 2% is not unreasonable. Next its pretty reasonable because of politics that the ability to deploy the latest technology has come effectively to a halt and with the new MRC wells that we probably have hit a physical limit as far as how much technology can improve production rates. So I think our current peak is really caused by hitting technical/political limits. If for example more oil was opened up to exploitation by the latest methods I now think we could boost production I don't think thats far fetched. Hubbert originally put the worlds total URR at about 1250 Gb. I don't think he was that far off I put it at about 1500 of resonably accessible oil and maybe another 250GB of very hard to get. Given that technology seems to have effectively allowed us to double our extraction rates since 1980 and that I think this has ended we face a post peak world in which we can extract at amazing rate and have no way to further increase production using technology. So give my estimate of 200GB of oil extractable at a fast rate and 18GB year of extraction production rates have to fall off a cliff very soon. In a sense I have now come to believe the Oil companies that claim that technology will save us. But the problem is it already has and has been since the 1980's. And given that discovery peaked in 1960 I believe Hubberts original estimate where fairly close. Campbell is the one who is in many ways wrong. Hubbert got the numbers right Campbell did not correctly account for technology to explain continued increases in production well past 50% URR. Maybe you could say he had it closer to right the first time. West Texas has a rule of thumb that production begins to decline at about 60% URR based on HL plots. I'm effectively saying that when you apply a correction for technical advancement we are probably seeing production declines begin when depletion is at 80-90% of the final real URR. Effectively the whole world is now one big Yibal field or not accessible to the latest methods both have effectively the same result in aging fields. I've got no real idea how much oil will be extracted given that I think production rates will begin to plummet over the next five years so too many external factors come into play. I think that very little of the remaining 250GB or so of extractable oil I think we will have in five years will actually be extracted. I do think that if we do extract it the global production rate will be down around 40-60 mbpd effectively half of what we have today but at that point back to a exponential decline rate or basically geologically constrained. Throw in export land and we are in for a wild ride I think. The bottom line is that if you do believe as I do that we have made significant advances in technology and that we have some decent number of world oil reserves after most discovery was past and before the production rates became heavily influenced by technical advances i.e 1250GB then it stands to reason the most of the URR estimates offered to date are badly inflated even HL has a built in assumption that we will continue to gain the same benefits from technology as we did in the past. The US is actually a poster child of steady technical advances increasing predicted URR so I even expect US production to start declining faster than current HL predictions since drilling more wells is no longer viable. If we really had 1000 GB of oil left for example we would not have stopped increasing right now if technical advances where the key driver we would have continued out to about 100mbpd or more before declining. I think the cornucopians had the technical aspects correct just they where way wrong on the URR. And I think Hubbert had the right URR. The bulk of the peak oil studies are incorrect because they don't correct for the technology effect. So overall some big mistakes seem to have been made on both sides but the end result is we are in a lot worse shape than both groups have estimated. I think you're spot on Memmel. It's certainly going to be interesting. Thanks I wish someone would come up with a good way to get a better handle on how technical advances have effected extraction capabilities. Extrapolating from price induced surges is a weak approach. Its sufficient to show the effect probably on the order of a few percent and that enough to conclude we are in bad shape. But maybe their is a more refined way. One approach could be to set a baseline back say in the fifties between discovery and production this would be the the non-technically shifted discovery->production curve what we should see is that the gap closes rapidly going negative in the 1980-1990's at this point production increases where effectively purely because of technical advances. The shock model uses a constant for this but technical advances indicates its critical variable. Effectively I'm simply saying you have to normalize the numbers to a standard vertical well/water driven field extraction model to get a good baseline. I think its correct to assume pressure remains a constant although how you water drive is important in and of itself and cannot be dismissed. Yes, the Shock Model incorporates a Markov rate term which maps directly to Khebab's a term. However, it is not entirely correct that we need to keep it constant. The shocks, or perturbations in the model are due to varying this term to match either technical advances or instantaneous economic disturbances. This is doable mathematically because the effect essentially happens at the end of the pipeline, which has little impact on the stochastic approximations that we make prior to this. Yes it can handle it I'm suggesting a shark fin curve as a good model for technical innovation. Think about it. Take airplanes or even oil discovery the changes where slow at the beginning then exploded exponentially then hit physical limits then effectively when to zero. Cars today for example are effectively at the end of their technical advancement as far as being transportation devices. The difference between a cheap Ford and a Mercedes are pretty small. Compare this to a luxury car in the 1920 vs a pedestrian model. Plus I thin the shark fin curve for respiration bears a lot of similarity to oil extraction and also the financial one for patent drugs. Investment in the texas oil fields for example followed a shark fin model and in general this holds for commodities. The increase exponentially till the returns become unattractive vs other investment choices then drop to zero when they are unprofitable. So both the technology and the financial model could be plausibly modeled as shark fins. Export land is also a shark fin in profile if you assume that no other real economic value is created. Internal consumption increases exponentially until exports no longer cause increasing revenue then the economy collapses. So I think a lot of these perturbations are better modeled as a shark fin curves first order. A eventual return to Gaussian/exponential on the back side of the curve makes them fairly physical but this is just the inherent Gaussian in effect reasserting itself. The geologic situation is inherently a gaussian so like Russian production it tends to get back on curve. That’s really good Memmel, a big help to me. Yes at heart Gaussian because of a) geology, b) nevertheless a sort of constancy in discovery, production, etc. etc. and c) Gaussian-like is often what you get or see when you sum huge amounts of data and don’t really know where you are at. So it is Gaussian in theory ..only. But if one thinks about the upslope, and sees it in terms of processes that create growth (here, roughly, rate/efficiency of extraction), rather than the static compilation of measurement y of element x, it becomes an upsweep and one indeed then expects a shark fin curve. Its really neat, because well known shark fins include the pop/territory of empires. (see link, it is just one paper off the top of google..) Think of the territory of the British Empire: steep and straight up and then down the same way. Businesses are often shark fins as well. And the oil industry has many similarities to both those. Extrapolating wildly, or being very fanciful, one might say that the US, through its imperial actions - soft control, culture, ideology, influence, manipulation, control thru superiority /threat (plus finance), has acted to avoid the pitfalls of Britain and say Rome, the shark fin curve, and has failed thru its reliance on resources and that *in fine* the result is the same. The Afgh and Iraq invasions would then represent a return to an older model, incongruent and clumsy for the US - they can’t hold the territory and never really wished to (democracy, new leaders, the free market, domino effect and all that jazz..) because the supreme importance of ‘oil’ has made it into a ‘commodity’ divorced from just about everything else. And the US and North Sea which show gentler decline rates are not odd balls. Investment and technological adoption in the US has been huge same for the North Sea. One thing I've not seen is a graph of investment in the US. I have seen some plots of the well drilled in the US and its still incredible. HL in effect assumes business as usual and in the US the drilling campaign has even been increasing somewhat. The key is that backing the US decline rate is a heroic drilling campaign with thousands of stripper wells. I found this graph for a few North Sea fields. Pretty close to a perfect shark fin and you can see the return to a guassian. On the other end of the spectrum we have Russia that has generally been pretty constant with technology. Sort of a tortoise vs the hare race. Russia is now the worlds top oil producer. For the US an imperial strategy is really dumb. We gain little in the way of resources. We would be far better off exerting effort to develop technologies that remove our dependence on the very resources we are supposedly in the Middle East to protect. I guess I'm stating the obvious. But this is not obvious to a lot of people in Washington DC. So your 253-269 Gb estimate for KSA is a little higher than your own and Euan's previous estimate, a little less than Colin Campbell's? Which would mean they have produced about 45% of URR so might not be in terminal decline already? The above model is capturing the fact that you need substantial reserves in order to maintain high flow rates. However, all of this is very speculative, there is a significant error bar around the parameters a,b also. But I think the problem is that the amount of reserves required to maintain a certain flow rate had dropped substantially over the years. Thats the crux of the matter. 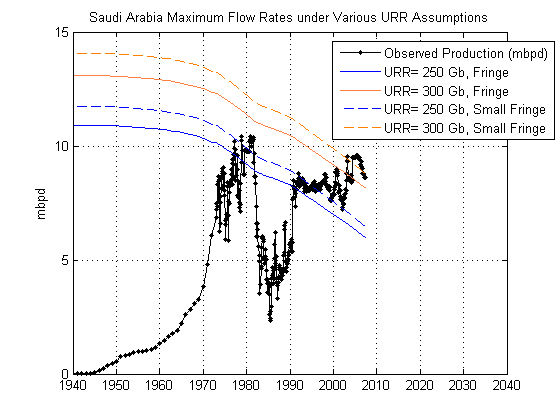 If we can get the same flow rates today out of a field half the size of one say 30 years ago don't you see a problem with these types of URR calculations. Horizontal drilling for example has proven to provide much higher extraction rates vs traditional methods given the same size reserve. I agree, the maximum flow rate achievable would depend on many variables: the type of reservoir, the recovery technology, the economic conditions, etc. Also, if you look at the logistic equation, the maximum flow rate is KxURR/4 so it depends on the URR but also on the K parameter which is the ultimate production growth rate. I was just surprised to get 270 Gb for Saudi Arabia using this simplistic method. I'm not surprised I think it makes even clearer that the their is some assumption that K is a function of technology. In my opinion K if its bound to technical factors follows the Shark Fin curve. This curve happens because of economic protection. And in respiration as you follow the C02 levels. Interestingly enough in Medicine its the assumed curve not a bell curve. So in a sense its a assumption of perfection. Its a good way to model technical effects since you get large returns at first then they go to zero as you hit intrinsic physical limits. My opinion is that the current peak in production is almost entirely because we are at the end of a technology shark fin curve and we passed 50% real URR at least 10-15 years ago. The fact that this simple analysis gives similar URR estimates to more complex methods says to me a systematic bias has happened and its not small. I think we just need to consider how to correct. Obviously if extraction increases where purely technical then production rates would go to zero from the top of the shark fin. Its not a pure curve but if its dominate like I expect then on the back side of the curve we will see accelerating decline rates and eventually we will see that the URR estimates made prepeak where inflated. Its just if you look at the great strides made in oil extraction technology over the last 30 years and consider any reasonable model for the effects of technology you end up with a 30%-50% inflation of the URR estimates because this K parameter has changed over time its not a constant. How on Earth do you come to that sweeping conclusion from that article?? That quote shows the exact opposite of what you said. Frankly, I think you have no idea what you are talking about. 3. We're going to see a much worse decline rate if we're way past the 50% point on real URR, and "geological peak" was hidden by technology. The links he provided may not be the best to support his thesis, but memmel is thinking fast and trying to explain his ideas fast, and this is a post--brainstorming--not a formal article. I think I may have some suggestions for testing memmel's ideas and increasing the usefulness of his ideas as a model, but I need to go and slog through a lot of data first. Exactly see my post with the North Sea graph almost a perfect fit. And the North Sea is in effect the poster child for technology driven extraction. And note rkshepherd's post below about market effects. This is very insightful, Mike. And, contrary to the posts below, it supports the Hubbert Linearization -- and Jeffrey Brown's assertion -- that the major oil producers are much more depleted than assumed. I've followed your discussions for quite some time. Compared to other forums, you are maintaining an impressive level of quality. Hope I don't repeat something you know already. The underlying math beneath Hubbert's peak idea is extremely simple. In fact the Verhulst differential equation is the simplest possible description for a development with a slow start-up and a saturation at the end. Validity of Hubbert's theory depends upon how 'constant' the coefficient for time influence is. For instance, if this parameter is quite different in the start-up phase and in the final stage (saturation) - which is possible because growth and saturation may be controlled by different causes - then the curve is distorted. It will still be 'bell-shaped' but the linearization may not work well any more. 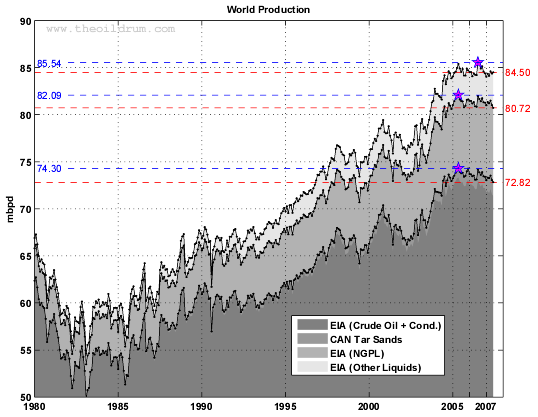 Peak oil, as well as Peak Anything, is a fact, but HL may not always be reliable. I could not agree more, I've moved on since to the Shock model. Or, more generally, HL and the Logistic may not always be applicable. (1) Assume that oil is discovered according to a stationary or non-stationary process. (2) Assume that oil extraction can only occur on these discovered deposits, and that the actual production flow lags these discovered reserves according to the rate equation that Khebab showed in this post. (3) This means that Discovery + Extraction leading to Production is a composition, or more precisely a convolution, of two functions, yet the Logistic curve cannot be decomposed into two or more elementary functions. Therefore, we must assume that the correlation of production curves to the Logistic is purely coincidental, and that one cannot explain away any fundamental process due to a spurious agreement between the curves. This leads to its applicability only as a heuristic, which of course has benefits if you understand the limitations in its derivation. Its a fairly simple heuristic it seems to be a good first order approximation and its useful. Because its not the correct equation for a physical model the Shock model should be considered the real model. Its not clear yet to me at least that we have gotten all the inputs and parameters right for the shock model but the model itself is correct. I believe that HL is related to how oil fields are extracted but and well lifetimes but thats just a belief. We actually need the shock model to in effect discover what the real variables are. Given a good shock model I think you can in a sense derive the logistic. Right now we have a incomplete real model so we can't really understand simple approximations such as HL since we don't know what they are approximating. As you can see its critical to have a real physical model since generally approximations can fail if the underlying assumptions don't hold for a given data set. But we don't quite have the physical model right in my opinion so we can't ferret out the robustness of the approximation. Although we call the results of a lot of our models URR HL URR is not the same variable as Shock URR it does not have the same units in a sense. The problem is in a lot of ways the first barrel of oil produced from Ghawar is not the same as the last barrel of oil produced from and American stripper well in 2007 the variables that control producing the barrels are vastly different they are similar only in that they are both hydrocarbons produced from underground. We generally treat these two barrels as equal. Thanks for the stimulating discussion. The nub of the arguments here seems to be that there is some guiding rule that we can apply to the future that determines an output or production value from some reserve value (or perhaps the reverse too). However, please remember, learned equation builders, that oil companies drill for money not oil and that is absolutely not the same thing. Technology moves on with some amazing well construction leading to big flows and faster, higher production, but only in the service of early cash flows and maximum return. A study (ours) of many individual offshore field production profiles, for example, shows a strong trend towards shorter, spikier field life profiles in fields started up since the mid 1990s compared to those of previous eras. Overall, we are probably producing less of the initial reserve value than before, perhaps by as much as 20-25% in the relentless search for better returns in a competitive stock market where technical reserve recovery matters less than financial performance. Average volumes of reserves activated each year against work input (drilling mainly) rises, suggesting greater efficiency but also suggesting that smaller fields are being left behind. Put another way, the rate of decline from peak is getting much faster so for a given level of spending there is increasingly less chance of meeting any incremental demand since most new oil goes to replacing depleted fields. A switch to state company dominance of the upstream in the next decade along with much higher average prices can change this, but not early enough to prevent the problem that oildrummers point up every day: we are losing the race against decline and shortage is likely to come before any significant improvement in reserve recovery factors or before demand reacts downwards to the price/tax burden. Exactly. And I think the shark fin curve is a good way to model this. Do you have a link to the study ? I pretty much have just thrown some chicken bones to figure out that the technological leaps started in the late 80's early 90's. I did however check with my Astrologer to confirm the chicken bone results. If your chicken bones had to put a number (or range) on the likely decline rate (considering the factors you mention and rkshepherd's market forces), what would the number be? How far is your personal mental number from Bakhtiari's, the Energy Watch Group's, etc.? Let's stipulate that we all understand the model still needs work, and there are many unknowns, and we're only hoping to get close enough for jazz. Well thats the problem it depends on how deeply technology has penetrated the oil industry. We can use Russia as and example of a steady state technical region. Key points are that the larges fields generally have been heavily invested in Ghawar Canterell etc. So we can expect steep declines out of these any day now. Next we would expect surprising declines in US production in effect any day now. The problem is the shark fin has this flat top before it drops off I think that this year is when we will reall start turning the curve but I've got no way to even guess how long we stay on the top. In earlier posts I conjectured that the swarm of offshore development since the late 1980 could probably be treated as a single large field and should go into steep decline any day now. Right now my best guess is steep declines should start early next year just in time for summer driving season. But the nature of the curve makes it REALLY hard to understand when it will start downwards. I think Bakhtiari's from what I've seen has done the best job modeling but I'm going with Hubbert's URR estimates personally. What I did was take my idea and reinterpret Campbells paper. And we believe Hubberts original prediction. I'm not finding the exact link for his URR estimate but he gave 1150 GB at a total. I'm saying that today we probably have a total URR of about 1200 GB with 200GB of easy oil left to extract. What happens after this is not really relavent but basically we get back on the Gaussian if we are still extracting oil. I'm not interested in 500GB of oil out of watered out fields and deep offshore. We could or could not extract a lot of oil in a long tail its simply not important. Given 18GB a year now for world oil extraction that gives us about 5 more years of "easy oil" left total. We assume this production will drop off in a linear fashion on the back side but I've got no clue what the slope is its steep however. I think that about 5 years from now we will be down to 40-60 mbpd or so after we have come off the technical shark fin. This puts us back on a HL curve centered in 1995 with a peak in the high 70mbpd to 80's. Several other good papers are there. Basically the idea is we believe the estimates from before the 1990's everything afterwards is highly suspect. Given the peak in discovery was in the 1960 its reasonable to assume the projections made in the 1980 where not that far off. The key is they are a LOT less than later predictions. In between from say 1985 to now technical innovation has driven production growth for the most part. So given all this we may be looking at say a 20mbpd decline over 5 years this translates into about 4mbp year decline rate if its linear and it should start effectively now. Understand that technology has not only allowed us to continue to increase production post peak but its allowed us to overcome the geologic decline rate. Your talking what 6-8% higher production vs a hubbert decline with constant technology. I'm more impressed every time I think about this at how good we are at extracting oil. I fully understand why a lot of people in the oil industry reject the peak oil concept they know what they have accomplished. But you can see if you put it all together that we have managed to use technology to up production rates by almost 50% vs a steady state case and what goes up must come down. The only real variable is my assertion of 200GB of easy oil left. I think that the 40-60 Mpd "natural" extraction rate once we get back on curve is pretty good. So a steady loss of 4mbpd per year over the next five years seems pretty reasonable and I'm pretty sure this starts in 2008 but thats again questionable. To put this in context I'm saying we are losing a Ghawars worth of production every single year even I think thats crazy but it means a 4-5% decline rate first year off the top of the shark fin. I think we are at 2% now so its initially a doubling of the decline rate. So really short term this is predicting say a 3-4mbpd drop in production next year. If I'm right. Going off off known fields this means Ghawar and KSA goes into decline Cantrell continues and we get unexpected declines out of the Gulf of Mexico and the North Sea. The new prediction is that we see a big drop in production out of the Gulf of Mexico. So actually if you add up all the declines possible from a number of places and assume shark fin declines then 4mbpd down next year does not look unreasonable. So this model is not as impossible as it looks at first glance. If we are on our way to being down by 4mbpd by the end of next year this implies we will be loosing about 333kb a month in production if you just divide it. So it should be obvious fairly quickly so by say April this downturn should be blatant. Understand the dates could not even be considered remotely a guess but you can see that within 3-4 months of dropping off the shark fin it will be obvious if if I'm right. Its not even worth discrediting since it will soon be obviously right or wrong at the absolute latest if this is right we should fall off by September. So to narrow it down a bit I think that we will be down by at least 300kb-900kb per day by April through September since I can't really tell when it starts once we are down by at least 300kbd then we end that twelve month period down 4mbd. Sort of a sliding window prediction but even my crystal ball can't see the start date. So a bit of a strange prediction but I'm I think my neck is well out on the chopping block and but I'm pretty sure 2009 is going to be a crappy year. and then convolve in my shark fin from over extraction. So you could see it as correcting WOCAP for overestimating remaining URR and underestimating how much over extraction has taken place. The total technical over extraction seems to be in the range of 200-400GB I think its closer to 200GB so via technology we seemed to have extracted about 200 or so extra GB of oil early so to speak and this seemed to have caused a 200-400 barrel over estimate on the backside. So its sort of like double counting a barrel its added to both the front side as produced and included in URR estimates on the back side instead of being moved to the front side of the production curve and subtracted from the back side. Thanks a lot for the interest in my work. It's very good to know that the paper's being read. I agree with most of what's been written in the posts. Khebab's extrapolation to URR seems to be a legitimate exercise. It is indeed difficult to reconcile actual OPEC extraction rates with their reported reserves data if the linear rule applies (which it seems to rather well in the fringe subject to some caveats). I have to hold my hands up and say that the extraction technology in the model is somewhat crude (apologies for the pun). And this technology of course plays a part in underpinning the linear rule. But one thing I also found in the paper was that the linear relationship was impressively stable through time - there was no noticeable change (at least not in the fringe) from 1978 to 2002 when just looking at cross-sectional data. As it happens in the model the slope term ('a' in Khebab's notation) actually only depends on extractors' discount rates. Improved technology falls into the intercept term 'b'. So the low OPEC slope term is preposterous whatever your state of technology. It is not crude at all. Many of the most important relationships in thermodynamics and statistical dynamics have a basis in approximations at this level of crudity.